Compare and Combine are two very useful features of microsoft Word but seldom used by most of us due to our unawareness about these features. These features lets us compare two documents and find the difference between them. So first let’s see some situations in our daily works where we find their use. In some cases we may have different versions of the same document. We may need to compare these different versions to see the changes between them. Or we may need to combine them to generate a final copy of the document.Using the compare feature we can examine the changes made at every line even including a change in white space. Also another application of these features come in our resume preparation. We may usually have more than one copy of resume prepared for various purposes or modified over time. At times if want to compare or combine any two copies to create an updated resume then the compare and combine feature can be of great use. At first glance it may appear that these two features are same. But they have different functionalities. The combine feature actually allows us to find who made what changes in a document in addition to just marking the changes. 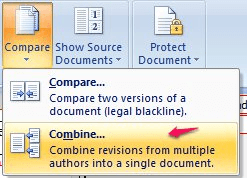 But the compare feature just compares the content differences between two documents. Now let’s see how we can use these features. 1.Open Word and you can find the Compare option under the review tab.Click on Compare. 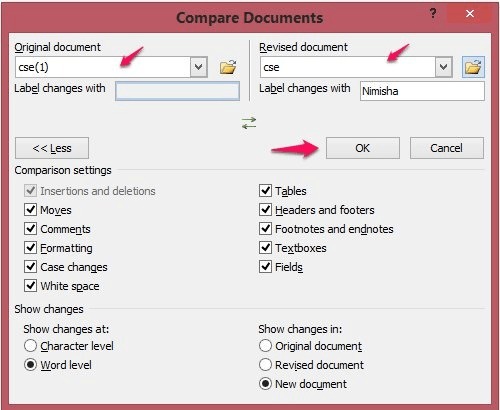 2.Now from the menu select Compare option to compare any two documents. 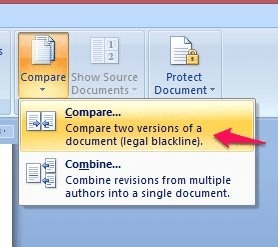 3.Now the compare documents dialogue box will appear. We have to select the two documents that are to be compared. Select an original document and a revised document. Under the comparison settings we have different options that can be checked according to our preferences. The changes can be compared at word level or character level. It is better to choose the option of showing the changes in a new document to avoid messing with the original documents. 4. 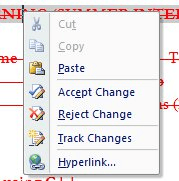 On clicking OK, we will get a new document which will have the differences marked. In the side bar we can see the number of insertions, deletions, moves and formatting changes. Each change will be marked and explained well. In the new document strike out text is deleted, red underlined text is added and green text is moved. 5. By default we will have the original copy of the document selected and displayed in the right panel. We can scroll down the original document in the right panel and the new document with the changes marked will scroll along accordingly. But we have another option to hide the original document. We can select this option from the review tab . 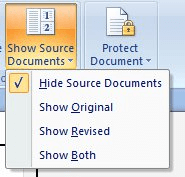 Go to Compare option in review tab ->Show Source Documents->select Hide Source Document option. 6.Now in the Tracking tab select the Balloons option and click on Show revisions in balloons. Now in the right panel we can see the revisions in the document marked in detail in balloon notification form. This gives an easier review of changes in the documents. 7.If you want to have a final copy of the document from the original and revised copies then you can do it easily by editing the new document with all the changes marked. At any change, just right click on the line and choose whether to accept or reject the change. Thus we can add the changes we want and discard the changes not required to create a final copy of the document. Combine feature works similar to compare. We have already seen the difference in their functions. Combine can be used to merge two versions of a document to create a final copy of the document. When we use combine to generate a new document then all the changes in the revised document become tracked changes identified by the authors who made the changes. In the review tab select Compare option and click on Combine. 2. 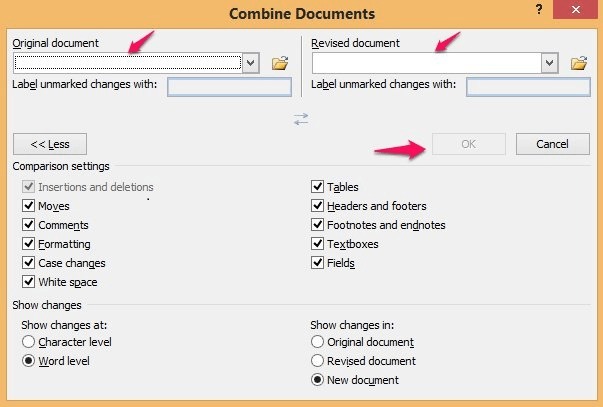 In the Combine dialogue box select the original and revised copy of the documents to be combined. Adjust the settings according to your preferences and click OK.
After this you will get the same layout as before in the compare option. You can view the changes , right click on them and choose whether to accept or reject the change. Thus the revised new document can be generated. Hope you got a clear idea about the compare and combine functionalities. Make use of these useful features to make your works easier and save time.